Take a trip down memory lane with these nostalgic family holiday tips. Let's take it back to when times were simpler, before Booking.com or TripAdvisor, when staying in a motel was an exciting experience after mum finally threw in the towel because of another disastrous camping attempt. When a chocolate on the pillow, those little bottles of shampoo and conditioner in the bathroom, and a travel guide on the bench were enough to excite any visitor. Here Bundaberg and Bargara we have a plethora of motels offering a modern look to the much-loved, nostalgic motel while keeping the old-school charm we have come to know and love. Try: Spend a weekend at Bargara Beach Palms Motel, located a stone throw from the beach, cafes and restaurants and a very short drive to Mon Repos to see the turtles. This charming Motor Inn offers modern conveniences with retro flare. Looking to go even more nostalgic? 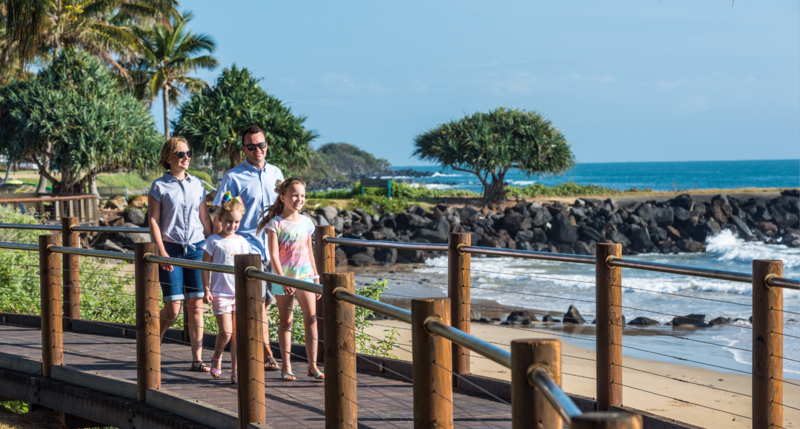 Book a site at Bargara Beach Caravan Park for a week of sun, sand and surf with the kids. Did you go see the turtles as a kid? Take a trip down memory lane with your kids and book into the Mon Repos Turtle Encounter. Spend your days soaking up the sun with the sand beneath your toes at one of our many beaches while the kids turn dad into a sand-mermaid or have a sandcastle competition. Try: Create nostalgic memories for your kids at the Mon Repos Turtle Encounter. Spend an afternoon on two wheels (or four wheels for the beginners) and hire out some vintage bikes from Bargara Vintage Bike Hire and go for a ride along the foreshore. Nothing says summer in the early 90s like fish and chips on the beach. Ditch the fancy cafes and formal restaurants, grab a picnic blanket and head down to the beach to watch the sun go down. No summer holiday is complete without ice-cream. With ice-cream shops now offering cups we can't help but be nostalgic for a homemade waffle cone and ice-cream dripping down our arms. Try: Grab your fish and chips and set up at the turtle park playground. Let the kids run off some energy and enjoy the view as the sun goes down. You can use the excuse of being at the beach to eat ice-cream every day! Grab a scoop or two of your favourite flavour or try locally made Mammino ice-cream.